November 2, 1988 Boston Bruins vs Toronto Maple Leafs. 7-2 win. November 3, 1988 Boston Bruins vs Hartford Whalers. 3-5 loss. Today, overage college players are signed by NHL teams as free agents. It's an open market and players are left to choose what team to sign with. 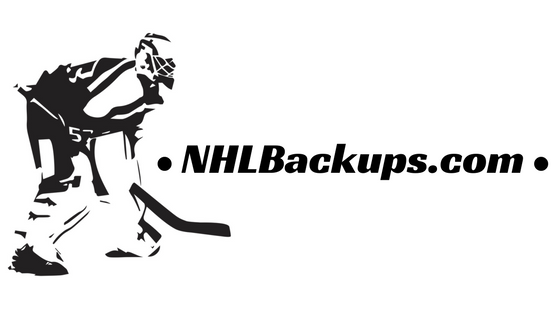 Between 1986 and 1994 the NHL held a supplemental draft for this purpose. Overage college players who had emerged as late bloomers and had not been selected in an NHL entry draft entered the supplemental draft. In 1987, the Boston Bruins used the first overall pick of the supplemental draft to select Mike Jeffrey from Northern Michigan University. 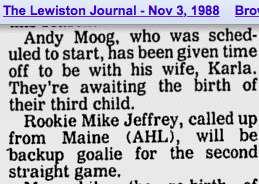 Early November, 1988 Bruins goalie Andy Moog left the team to be with his wife as she was about to give birth. He missed two games and Mike Jeffrey was recalled to dress as his replacement. Jeffrey dressed as Rejean Lemelin's backup. 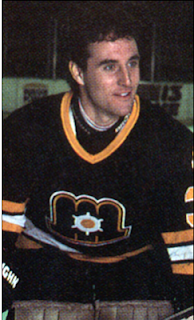 Jeffrey retired after just two seasons in the Boston Bruins system.